Let’s be clear. These are not oatmeal cookies with chocolate chips in them. They are chocolate chip cookies with a little bit of oatmeal. Big difference. Now you’re probably thinking, What’s so Christmas-y about chocolate chip cookies? The answer is – nothing, really. 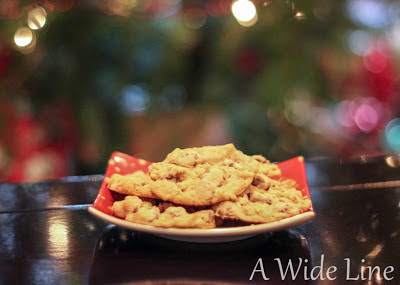 It’s just the only time of year my family made these incredibly sneak-able cookies, and it’s the only time I make them, so I associate these cookies with Christmas. Plus, from what I hear, they’re Santa’s favorite. Cookies will not look done! They will continue to cook on the cookie sheet. Yeah, about those modifications above? Don't do them! I made more of these yesterday, and they were a colossal failure. I ran out of shortening and was just a smidge shy of one cup. So I added a little butter. Then I decided to add half a stick of butter because... why not? Then I decided to forego the oatmeal entirely, and I upped the chocolate chips to one and half bags instead.